Chrysanths are the perfect candidate for revival. Some may think they’re old-fashioned, others view them as the preserve of exhibition growers, but those are exactly the same brushes that dahlias used to be tarred with. There are plenty of hardy, easy-to-grow chrysanths that look amazing in autumn gardens. These are the ones I’m backing to be the next big thing. There’s a great colour range too, including autumn-friendly yellows, oranges, reds and russets as well as pink, white and purple. The best time to plant hardy chrysanths is early in the season – spring is perfect – so they’ll have all summer to get established before they flower in autumn. 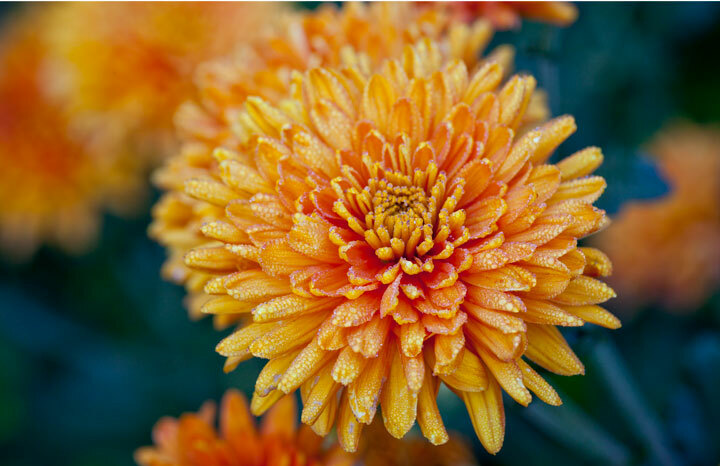 In the chrysanth world, plants are divided into late flowering and early flowering. Most of the hardy chrysanths are early flowering but you’ll probably end up thinking of them as late because they flower for months from September onwards – even into December. After the flowers have faded, cut back the old stems, taking care not to damage the new green growth at the base and mulch each plant with compost or straw until spring. If you’re in the garden centre looking for chrysanths, look for the magic words ‘garden’, ‘hardy’ and preferably ‘perennial’ then you’re on the right track. At this time of year, garden centres will have a good selection, but some can be a tender houseplant kind, whereas others are only good for bedding out in autumn and won’t survive the winter. Among the hardy types there are chrysanths known as garden ‘mums, which includes those referred to as Korean or Rubellum varieties. These are pretty much hardy, but may not survive a very hard winter. Also hardy are spray chrysanths, such as the Spartan or Pennine varieties. Cushion ‘mums (so called because they form low-growing, compact mounds of flowers) are great for pots and the fronts of borders. They’re fairly hardy, so should survive winter unless you’re in the coldest, wettest part of the UK. This tall perennial (1.2m/4ft or more) has sprays of small violet-blue flowers with yellow anthers poking out. Looks lovely weaving through borders. This special variety is similar in height and habit, but its flowers are double, made up of layers of petals, producing clouds of teeny-tiny mauve pompons. More gardening tips plus everything you need at 50+, in Yours Magazine. Out on Tuesdays, join us for a friendly catch up every fortnight!